The following originally appeared on 2/18/09 at Exit 51. I love a good chicken salad. Its one of those dishes that, when done right, can shine in its simplicity. In many ways, it is the ultimate test of a cook. Almost anyone can learn fancy techniques that dazzle and delight. But how many of us, when faced with the challenge of taking a bare minimum of the simplest of ingredients, can create a dish that is memorable because it hits all the right notes, because it becomes more than you imagined possible? I don’t have a recipe for my go-to chicken salad. It comes from the prepared food case at The Fresh Market and is everything I want in my chicken salad. As far as I can tell, there are three ingredients – chicken, celery, and mayo. That’s all it needs. And it is the standard by which I measure all other chicken salads. 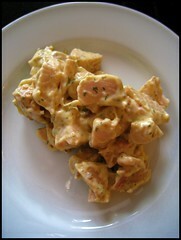 During my weekend with Ina, she made Mustard Chicken Salad, which uses both mayonnaise and mustard. I’ve long known the beauty of mixing mayo and mustard together. Have you ever dipped pretzels in a mix of mustard and mayo? If not, I’ll wait here while you go experiment. Start with a couple of tablespoons of mayo and gradually add mustard till it’s creamy and tangy at the same time. See what I mean? That’s good stuff. So I imagined that a chicken salad that used one of my favorite flavor combinations would be a home run. But I think it ran out of steam somewhere around second base. I prefer to have a drier chicken salad, not too wet and definitely not thick or gloppy. And while not gloppy thanks to the white wine, Ina’s Mustard Chicken Salad is just too wet for my taste. I can’t imagine a slice of bread being structurally sound enough to support a sandwich made of this. But all is not lost. Because when added to a mix of lettuce and spinach, you’ve got yourself a lovely salad. The wetness of the chicken salad provides just enough of a dressing to moisten the greens. This would make a light lunch by itself, or pair it with some soup and you’ve got a fuss free dinner. So if you’ve got the few simple ingredients on hand that go into Ina’s Mustard Chicken Salad, I think it’s worth a try. Place the chicken breasts on a sheet pan and rub the skin with olive oil. Sprinkle liberally with salt and pepper. Roast for 35 to 40 minutes, until the chicken is just cooked. Set aside until cool enough to handle. Remove the meat from the bones, discard the skin, and dice the chicken in large bite-size pieces. Meanwhile, add the broccoli florets to a large pot of salted boiling water. Cook for 1 minute, until crisp tender, drain, and place into a bowl of ice water until cool. This will stop the cooking and set the bright green color. For the dressing, whisk together the mayonnaise, wine, mustards, 1 tablespoon salt and 1/2 teaspoon pepper. Add enough sauce to the warm chicken to moisten well. Add the tarragon, broccoli, and tomatoes and mix gently to combine. Refrigerate for a few hours to allow the flavors to blend. Serve at room temperature. My husband fears the mustard, so I’ll never get around to making this. Plus, he doesn’t do “wet” chicken salad either. Ina loves her mayo, doesn’t she? Ina’s relationship with mayo is kind of disturbing.� And I say that as someone who lurves the mayo.